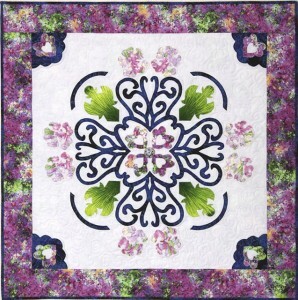 We’re calling it a Charm Swap but it has nothing whatsoever to do with Moda 5” square charms. In our case, the use of the term “charm: is referring to the old-time get together of quilters who brought fabric to swap with their friends and everybody shared in the bounty to make happy, colorful scrap style quilts. 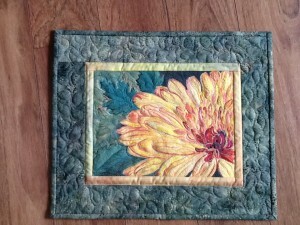 We will all be bringing fabric to swap with each other and get started on making a quilt from our new treasures. In addition, we will be teaching a few things: sewing a partial seam and cutting 60⁰ triangles, for those that are interested, as well as several little Deb & Terri tidbits. You Must Bring 30 strips of fabric to be used at the swap. 30 strips of fabric cut 2.5” wide and WOF (width of fabric). 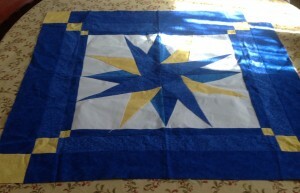 You must also bring at least 1/2 yard of your own fabric to use for the triangle centers. We recommend that this fabric be a solid or reads-as-a-solid but it doesn’t have to be. We also recommend that it be very light or very dark – not a medium value fabric. To save time, cut this fabric into strips that are 4.5” wide X WOF. Cut at least 2 strips. We highly recommend that – in addition to the strips you plan to share at the swap – that you also bring at least 5 to 10 more strips to use on your own quilt. 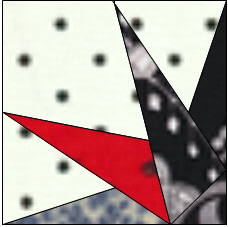 There is no set size or style for this quilt. That will be totally up to you. You can use this start to make a tablerunner or a small lap or anything your imagination can dream up. The basic block we will make is a 10“ triangle. You will need your sewing machine and all of your basic sewing supplies. It is recommended that you also bring your long ruler (aprox 8” X 24”) for cutting WOF, etc. Bring your lunch and anything you wish to share and whatever you want to drink. The beauty of these paints is that they are fast drying and do not bleed into one another. 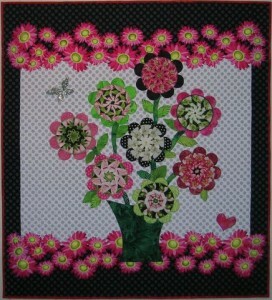 The mum photo maybe painted in your choice of colors therefore the threads you choose should complement your mum. Please bring an apron for old clothing as the acrylic paints stain. The focus of this class will be blending primary paints to achieve a value of color which represents your mum. Thread painting the mum to embellish veins and petals can be achieved with free- motion embroidery. I will demonstrate this technique, time may not allow for this to be accomplished during workshop; however you will know how to before you go home. Pellon 910 non fusible interfacing, – 2 layers cut 10 x 13 or 1) 10 x 13 piece of Sulky “Fuse n Stitch” stabilizer. Optional: Sewing machine with ability to lower feed dog. Depending on finishing painting of mum. Become familiar with stitch width and upper thread tension adjustments I used 2 to 3 values of color each for dark, medium, and light to highlight, also 2 greens for leaves and black or very dark green for crosshatching. Bobbin filled with 50 or 60 wt. thread or invisible thread of your choice Free- motion thread painting cannot be accomplished without the spring loaded free-motion foot. 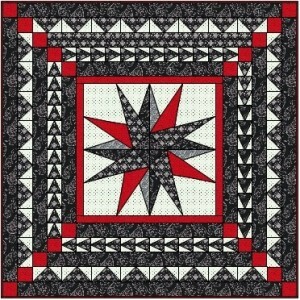 This is the supply list for the class or you can choose a pattern from her website: Atimetosewquilts.com. Optional fabric kit available for both versions Contact Cheryl Almgren Taylor or cheryl@atimetosewquilts.com for more information on kit. Kit cost is $30.00 for each. 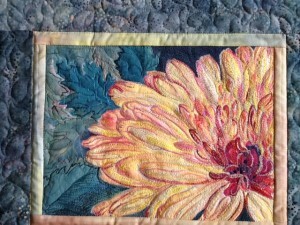 Kit includes fabric for top, appliqué and binding and contains similar, not identical, fabrics to photograph. Sewing machine in good working order with zig-zig or blanket stitch. Yardage is based on 42”-wide fabric. Each block is made with two paper sections. This block will help you on your way to a mariners compass. 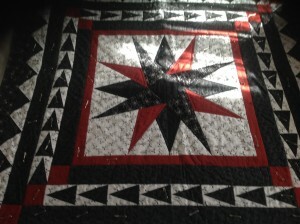 This quilt is made with 4 paper pieced blocks, and two paper pieced borders. Elizabeth Barton will be our guest speaker at our March meeting on Tuesday, March 11th. The topic will be From Inspiration to Quilt. For more information on Elizabeth, please visit her website. Get a binder and fill it with protective sleeves and get ready to start collecting pictures now!!! Please come to the workshop with different types of pictures as outlined below. 2. 3-6 photocopies of paintings you admire of the same subject e.g. if you want to make a quilt about trees, bring your tree photo(s) plus 3-6 paintings of trees by excellent painters such as Constable or Kahn. 3. color inspiration pictures e.g. paintings or natural scenes whose colors are gorgeous! Plain paper for sketches and notes. Sheet protectors (10-12) to preserve your designs. Ruler, pen, pencil. Pencil sharpener. A few colored pencils or felt pens. A light grey, a medium or dark grey and a black felt tip pen is very helpful for value studies. ¼ yard (or so) of at least 25-50 fabrics that are either solid colors (hand dyes are fine) or have a nondescript print…the colors should be similar to those of the color inspiration picture you chose. Be sure to have a good range of values – from very light to very dark. If your main colors (for example) are to be yellow and purple, bring lots of different yellows and purples. If you’re a Very Quick Worker: Batting or flannel (sufficient for your quilt(s)), fabric for quilt back., and basting thread or safety pins. Rotary cutter, board, rotary ruler guides, spare blade – or scissors. Marking pencil (white charcoal is good) (or silver) for marking fabric for cutting. Freezer paper (if you prefer to make templates, otherwise don’t bother). Sewing machine in good working order ( if you are a fast worker and want to start machining, if you are happy with pinning, basting or hand stitching you can do without a machine). Usual sewing supplies: thread, needles, pins, scissors. An acrobat PDF version of this supply list is available for download.